I’m thinking some of the styling will place this shirt somewhere between casual and dressy. The inspiration shirt is a subtle, two-tone design. It uses a slightly stronger accent color on the inside cuff, front band underlap, inside collar stand, and the underlap on the sleeve plackets. (It’s not clear from the photo if the undercollar is also in accent). I’m copying most of the style details for my own shirt. I visited Britex Fabrics late this week, and picked up a yard of fabric in a stronger shade of pink to provide the accent pieces. So you tell me – is pink my color? (Yes, the wall behind me is also pink). The inspiration shirt has beveled edges on the cuffs. This was a look I was seeking even before I revisited that photo. 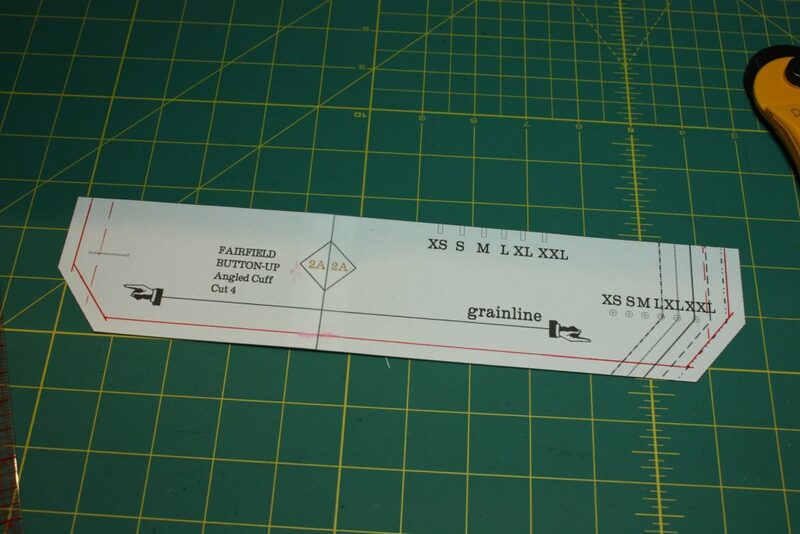 I looked at the pattern for Thread Theory’s Fairfield Button-Up shirt. 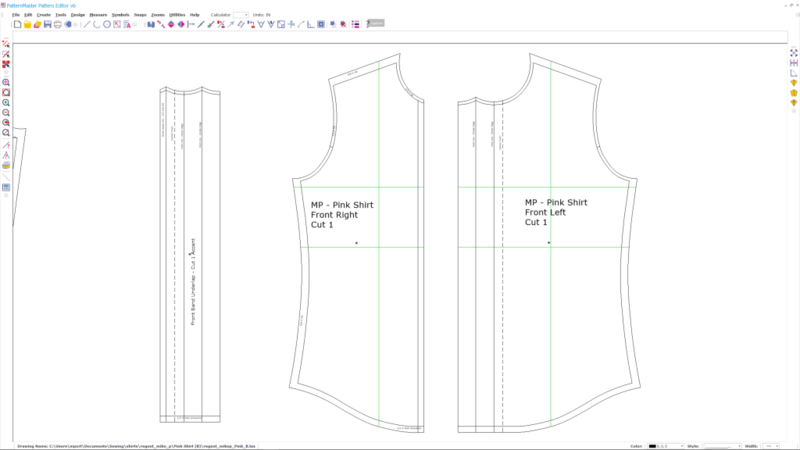 The pattern has a selection of alternate collars, cuffs and pockets available for free download. (Links to the free pattern downloads are on the Thread Theory page). I printed out their beveled cuff, marked and trimmed the seam allowances (red in the photo), then folded it up to get an idea of how it looked. The pattern gives a nice triangle notch on the cuff, with a gap about 3/4 inch wide at the cuff edge. I chose to adapt the plain barrel cuff I had produced for the Blue Gingham Shirt. There are some minor differences between my cuff and the Fairfield cuff, the biggest being that I place the button 1/2 inch from the edge rather than 3/8 inch on the Fairfield pattern. I decided to add a bevel to mine rather than adopt theirs. The sleeve placket on the inspiration shirt is also cool because it is a two-tone design. The overlap (with the little tower on most shirts) is made from the primary fabric, but the underlap (inside) of the placket is made with the accent color. To do this calls for a two-piece placket pattern. 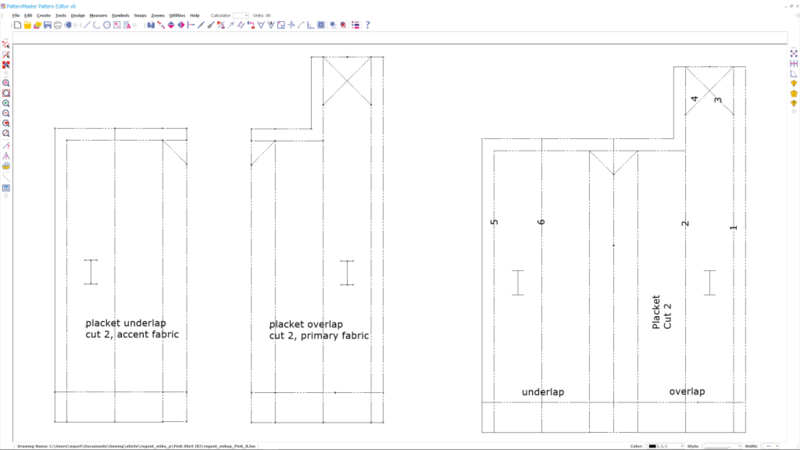 After reviewing my options for placket construction in David Coffin’s The Shirtmaking Workbook, and asking him a quick question over email, I settled for the easiest option: just divide the tower placket pattern down the middle. 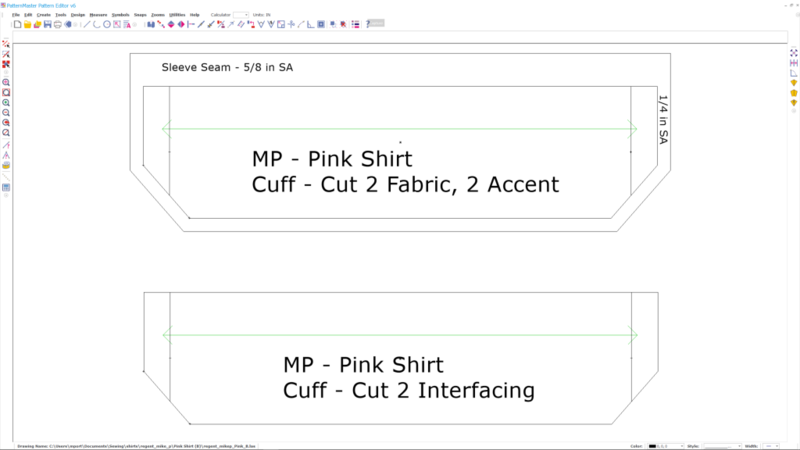 The overlap piece is cut from the primary fabric, the underlap is cut from accent fabric. I created the pattern pieces in Wild Ginger just to illustrate what’s going on. The standard placket is on the right. The divided pattern pieces for the two-tone effect are on the left. I could just as easily print out the regular placket piece and cut it down the middle with scissors, which is probably what I will do. The inspiration shirt has an accent underlap that is narrower than the overlap, about 1/2 inch. To reproduce this detail would require narrowing the cuff piece as well. I haven’t decided if a 1 inch or 1/2 inch underlap would look better in the accent color. I may make samples of both and decide. The inspiration shirt uses the accent color on the front band underlap, where the buttons are sewn. It also foregoes a sewn-on front overlap. 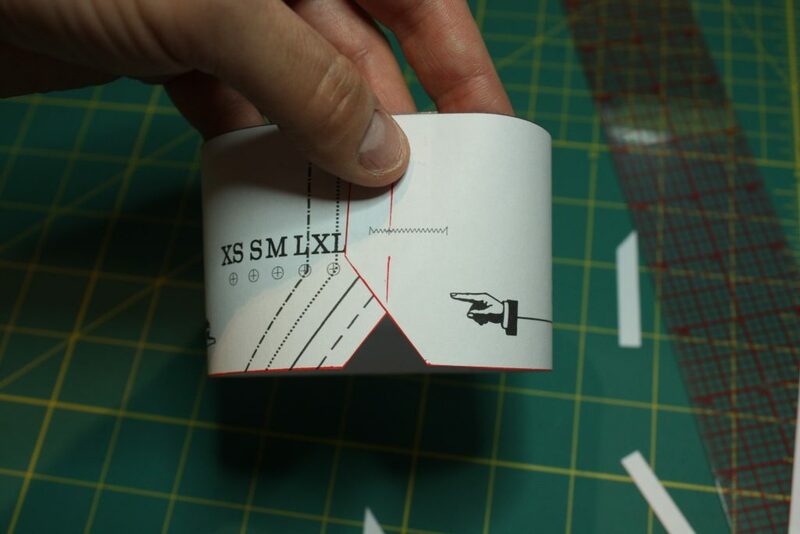 Instead, it uses a cut-on, folded band to get a clean, minimal finish on the front overlap. I took the same approach with the Tuxedo Shirt. I’m reproducing both those features on the Pink Shirt. 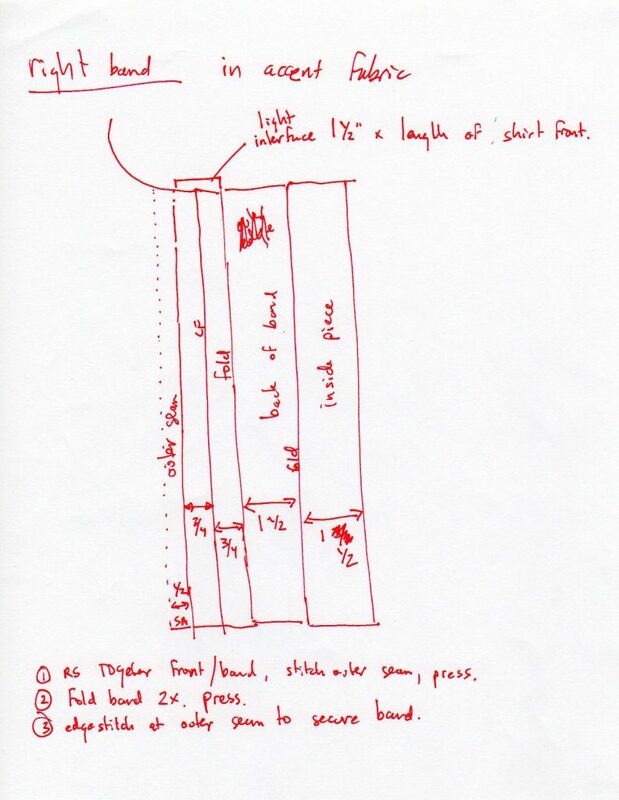 I sat down with some scrap paper and drew out the folding steps involved, to avoid confusion. Here’s how the pattern pieces came out, drafted in Wild Ginger. The right front is much narrower than the left, because the front band is a sewn-on strip of accent fabric (appearing on the left). Dashed line on all pieces is center front. (Click for a super-size version). For right now, I’m sticking with a box pleat on the back piece. 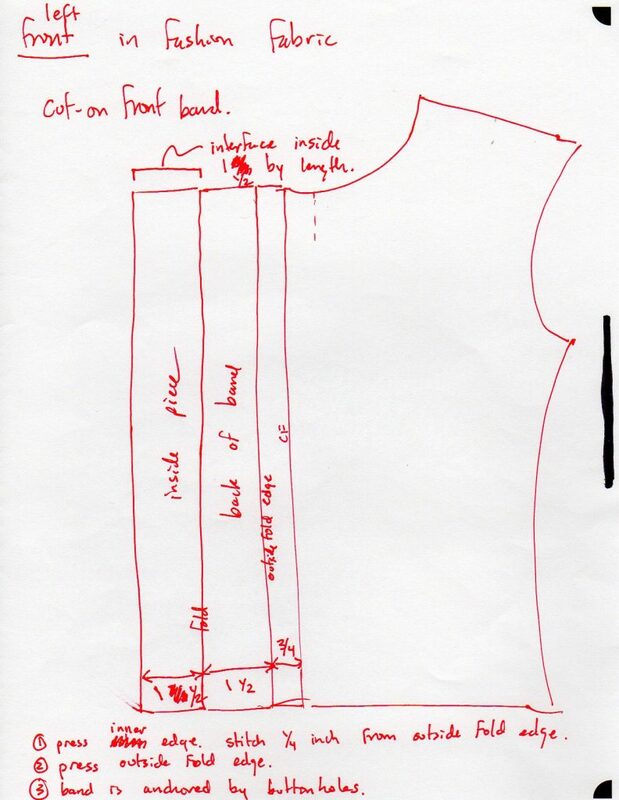 If I am ambitious, I may try two side pleats, one at each shoulder blade, but I don’t understand the fit implications and if I try this approach I would want to test on a muslin first. I’m not including any patch pocket on the front of the shirt. Gussets at the hems, maybe? I’d like to try this, but probably on a different project. The Blue Gingham Shirt used the button-down point collar I traced straight from the Famous Maker. 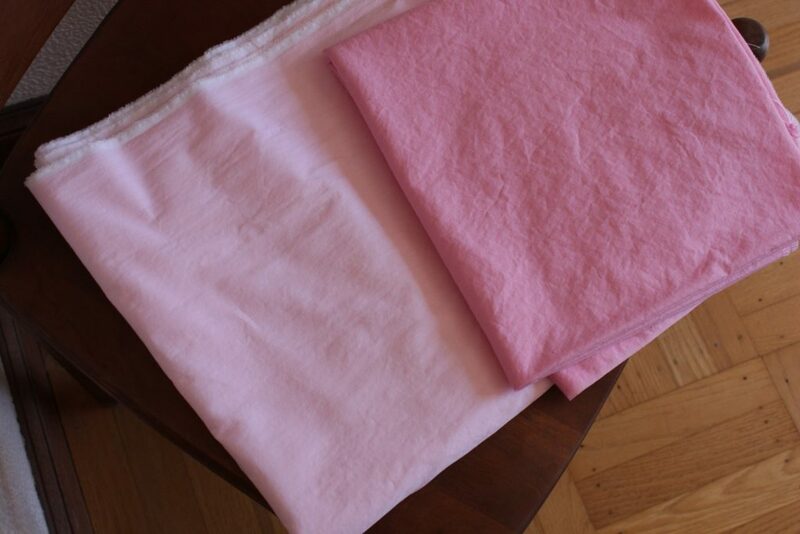 I plan to use a different collar on the Pink Shirt, which will be the subject of the next article in this series. Thanks for the Pam Erny article – I’m checking it out now. 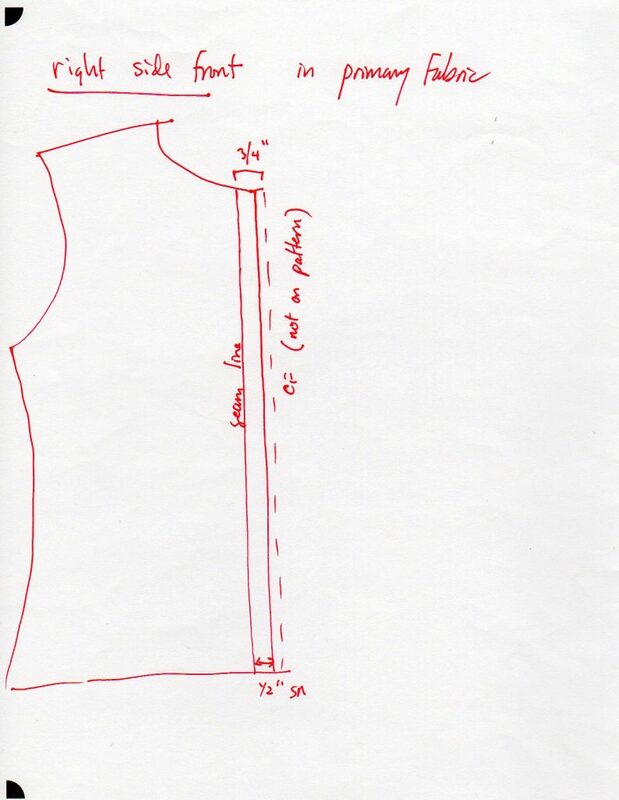 David Coffin contacted me to let me know there’s an error in the draft for my sleeve placket. The underlap should actually be a small amount narrower than the overlap. So, I’m revising my plans here. Thanks to both of you for helping out with the project! You made no mention of fish-eye darts in the small of your back, they could only accentuate your shoulders and svelte mid-section. 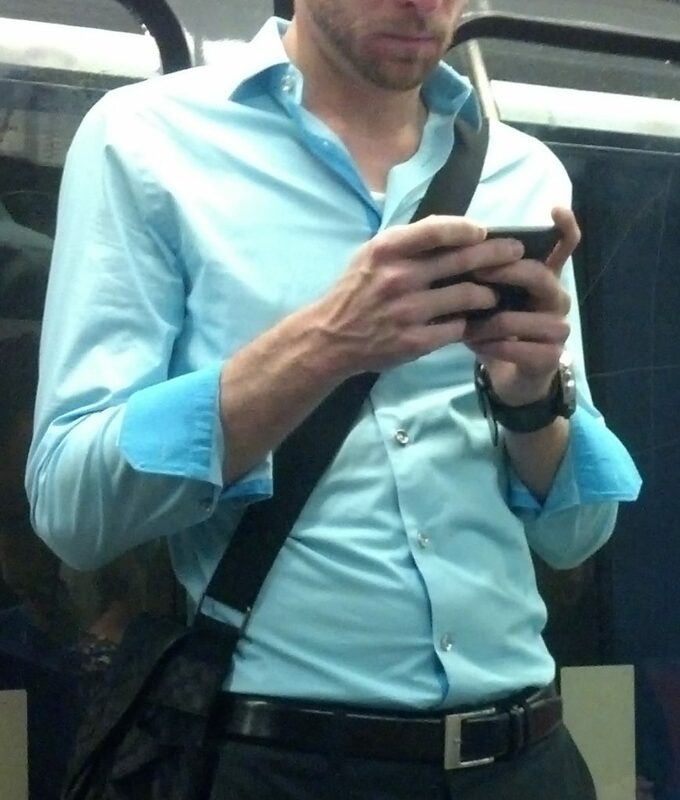 Just as you noticed a man in the wild, this shirt could be your public conversation starter/”man trap”. I considered back darts at the final muslin stage of my pattern; it still poofs out in back around the waistline. Tammy at Sips N’ Sews (my fitting consult) advised me against it, on the grounds that taking out too much ease will restrict movement and make the shirt uncomfortable to wear. But it may be worth an experiment. I think Tammy is correct: unless you go out at the hips in the back (and you might, I don’t know), the fish eyes will make the shirt puff above and below. I’ve been going with a central seam in the back for my slenderson (my pickiest customer) to deal with this. You don’t have to take out a lot to dramatically change how this will wear. 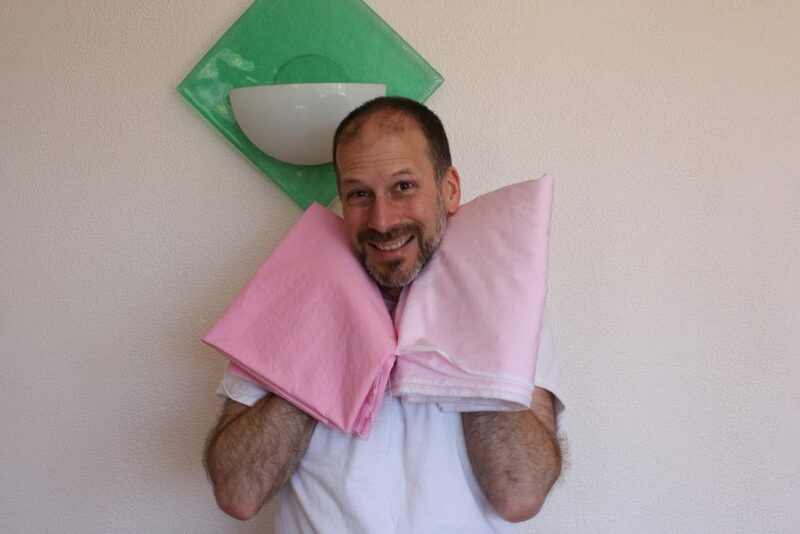 And pink is a manly color around here. I don’t wear it myself, but the gentlemen all do. I may yet try a dart to see what happens, butI felt I was homing on a good fit and I didn’t want to keep “stirring the pot”. And, I didn’t want to keep pouring time into fitting. I may go back to my yellow-green plaid muslin and use it as a guinea pig for the experiment. I have absolutely no qualms whatsoever about what pink says about my masculinity. My concerns were more about whether the color works with my hair, eyes and skin tone. It’s hard for us to imagine, but there was a time in history when pink was associated with boys and blue with girls. Here’s just one article on the topic. But things are changing. I see men, including straight men, in pink shirts and little boys in pink sneakers. The Ralph Lauren pink suit pictured in that article is amazing. You don’t have to make corset-forming darts, just the kind of darts which remove blousing. Any fitting tweaks could perfect your final fit for this, and future efforts. Mike Maldonado likes to cut his shirt sleeve placket pieces in half for sewing. It’s not the only way to do it, but it is a perfectly acceptable way. His sewing instructions are great. In addition to the underlap being made thinner, I’ve seen it cut on the bias, and not necessarily for design reasons, because the shirt I have in mind is a solid. I haven’t checked out the Mike Maldonado vids carefully yet – and I really ought to. I have a backlog of Craftsy classes to work through before considering more. He is a good instructor, but the vids I’ve seen are so blurry! Maldonado makes a really good point that cutting the placket down the middle lets you get a placket out of scraps of fabric. I also like the approach from the Pam Erny tutorial that MainelyDad links to a few comments above this one. Her placket can be made with just two rectangles of fabric, one slightly larger for the overlap piece. What advantages do you get from cutting the placket pieces on the bias, for a solid? I get the use of bias cuts to influence the structure and drape of a garment, but I don’t understand what that would do for a placket. 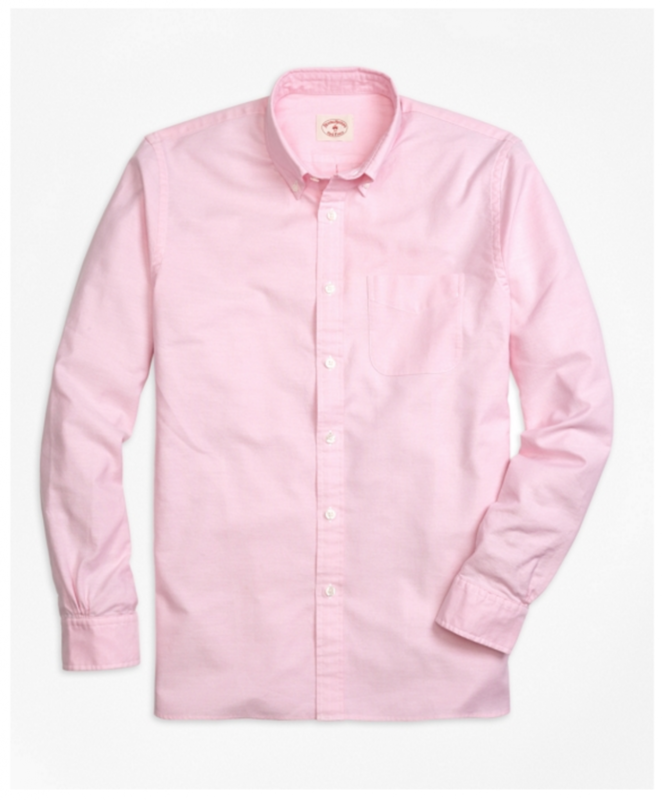 Years ago I purchased a pink Nordstrom dress shirt with some nice details such as buttoned cuff plackets and a beautiful contrasting white spread collar and cuffs. I lucked out, as it was a shade of pink that complemented my skin and hair. (I didn’t know anything about the seasons coloring system though from what little I now know, I think it has some validity.) I wore that shirt everywhere and received a lot of compliments, though I had to be careful about choosing ties and jackets. Pink is a great color and men need not be afraid to reclaim it. Take Back the Pink! Your inspiration shirt looks well-made and fits him well — slender but with just enough ease. I also like the fold-overs for the buttons rather than formal plackets. I prefer this kind of modern look over the more traditional/classic/preppy shirt. It’s a sport shirt but leans transitional…?